With salmon as fresh and lovely as this was, I was inclined to cook it as simply as possible. But, I still wanted to dress it up at least a little. This beautiful sockeye salmon was a second shipment I received from the Copper River/Prince William Sound Marketing Association. You can find more info about Copper River salmon, recipes, and a salmon locator on their Facebook page. Right before this salmon arrived, I had been flipping through Canal House Cooking Volume No. 4 , of which I received a review copy, and the Lemon-Butter Sauce from it was something I couldn't wait to try. Hamilton and Hirsheimer refer to the sauce as "similar to hollandaise but better—fresher tasting, not so cloyingly thick." They learned this sauce from Darina Allen at Ballymaloe where she made it with Kerrygold butter which is what I used as well. It has the same ingredients as a classic hollandaise but only two egg yolks rather than three or four. Like hollandaise, the sauce is whisked together over low heat, and lots of butter is added one piece at a time. Still, it has a lighter texture than hollandaise, and the lemon flavor is front and center. It's a fantastic sauce for salmon. Here, the salmon was plainly poached in salted water. You'll want to check the doneness from time to time as it poaches. I portioned the salmon into pieces before poaching, and for me, the total cooking time was just under ten minutes. You'll need to cook the salmon first and let it sit for a few minutes while making the sauce, or make the sauce and keep it warm while the salmon poaches. Both steps are so quick, you can't really do them at the same time. For the sauce, two egg yolks and a tablespoon of water were whisked in a medium saucepan over low heat. Then, eight tablespoons of butter were added, one tablespoon at a time, while whisking constantly. Each bit of butter should melt completely into the sauce before adding the next. You want to be sure the sauce isn't cooking too quickly, and you can take the pan off the heat from time to time while whisking. When all of the butter has been added to the sauce, you should remove the pan from the heat and whisk in a tablespoon of lemon juice. Then, taste and season as needed. The sauce can be kept warm by placing the saucepan in a larger pan or heat-proof bowl of hot water. The salmon was served topped with sauce and chopped chives and tarragon or Mexican mint marigold leaves which is what grows easily here. 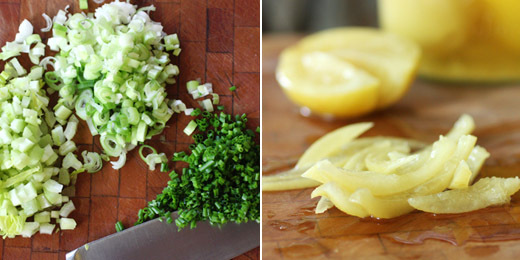 It's such a simple, lemony, just-rich-enough sauce, I'll be making it often. And, I loved that the instructions for making it were so straightforward. It's as easy to make as it is delicious. And, even though the salmon didn't really require any embellishment, this made it even better. A couple of other recipes grabbed my attention in this volume of Canal House Cooking. There's a Salmon Salad and a Halibut Salad, and I really liked things about both. I flaked the leftover poached salmon, and made a salad that combined the two. First, I added finely chopped preserved lemon and chives suggested for the Salmon Salad, and then I added the green onions, celery, parsley, and mayonnaise from the Halibut Salad. I served the result as tartines with mixed salad greens. Lemon punctuated both the sauce and the salad, but the fresh, wild sockeye salmon was the star of both dishes. 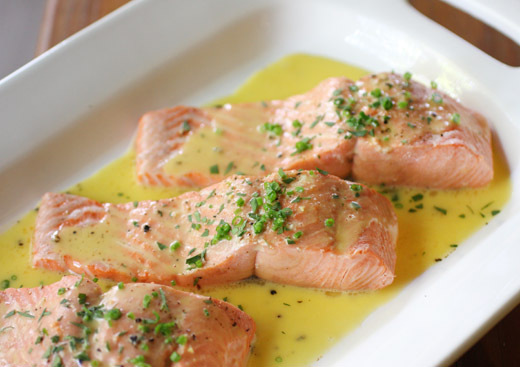 oh gosh does that lemon butter sauce sound incredible with the salmon! looks like a fantastic meal! Scrumptious! That sauce is wonderful and pairs beautifully with salmon. I had no idea Canal House was coming out with a new cookbook, I have all of their volumes (I think 5? ), I will have to check it out! Fabulous post, Lisa! First I've been seeking out a good source for Salmon and second, and more importantly at the moment, simply delectable! Wow Lisa, your salmon looks perfect...love the simplicity and how delicate this dish looks. Oh wow, the salmon cooked up is beautiful, and for me, it gets even better with that salmon salad. Yum! Fresh salmon is so succulent, a simple sauce is a perfect foundation for an exceptional meal. As I am an unabashed lemon lover this recipe is one I will try soon with local Monterey Bay salmon. I love salmon, but I've never tried wild. I just tried steelhead trout and loved it. What can I say about this perfect dish, perfectly photographed, Lisa? I adore sockeye salmon and love the way you've served it. All you need is my rhubarb crisp to follow, and a lovely mellow wine. My mouth is watering. I've been enjoying the fresh wild-caught salmon that we're getting here too. Another beautiful dish! 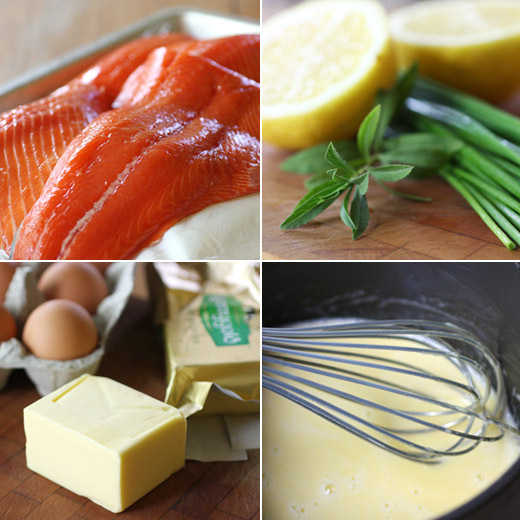 I like the idea of a lighter hollandaise- it sounds deliciously simple and so nice for summer. I can't imagine eating a regular, tick, rich hollandaise in this heat. 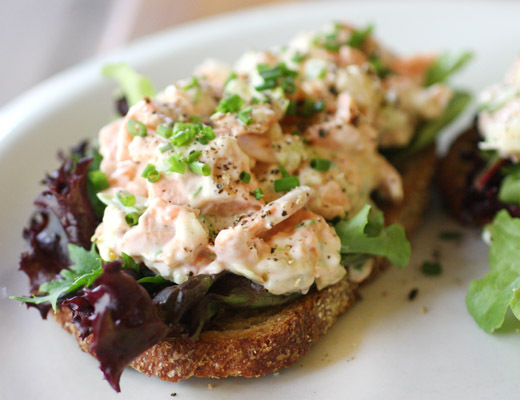 And brilliant idea for using up the leftovers- that tartine looks scrumptious! Wonderful, and I love the light butter sauce. I know what will be on the menu this weekend! Great photos,too! I don't even like salmon and I want to try that. Absolutely delicious. The salmon looks great quality and I'm sure the citrus flavour is quite intense. Beautiful cooking. Not a frequent fish eater but with Salmon it becomes a whole new story. This is exactly how I want my salmon done. Butter and lemon? Wow! I am heading out to make sure I am ready to have this for dinner, definitely nothing else. Your pictures are wonderful! i like the look of that sauce! hollandaise has always turned me off a little bit, and you've made this sauce sound like a vast improvement! 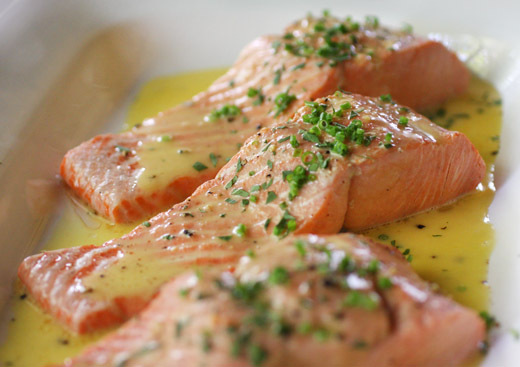 A creamy lemon sauce definitely does sound like the perfect pairing for this lovely salmon! Always looking for a variety of ways to cook salmon and sauces to go with it. That first photo is just fantastic. And...I can't seem to get my hands on Kerrygold butter. I've heard that it is so good because the cows are all grass fed in the fields. I'll keep looking! Wow beautiful and the sauce sounds a perfect match. Gorgeous looking dish. Wild salmon is the best - the only kind I'll eat now. Sauce looks terrific. Good stuff - thanks. I have salmon at least once a week if I can and this salmon with lemon butter sauce looks really delicious. Wow! I made these last night for dinner, and I've finally found a recipe to keep. I did the trick and these cooked up nicely. Even my husband said the flavor of these were awesome. Amazing! We're all licking our plates! Thank you so much!